My column on the University of Texas incident is online now. A good friend posted this to me, and she’s absolutely right. Funny that most of the national coverage hearkened back to Va. Tech. Those of us whose blood runs burnt orange immediately flashed back to the history we were taught (or lived) about Whitman. It’s a big freshman lore experience to search fo r Whitman’s bullet holes, which are still pretty easy to find if you are told where to look. When I was in school, the Tower observation deck was still closed. And at the time of Whitman’s rampage, there were no campus police, and no arms on campus. Civilians helped take Whitman out. They shot up at him (along with police), making him take cover and hampering his aim, which probably saved lives. An armed civilian was also part of the four-man team that eventually took him out at the top of the Tower. I wanted to include these facts about the original campus killer, Charles Whitman, but I couldn’t fit it all in with a 600 word limit. Thanks Lesley. And thank you to Sharon Grigsby and Mike Hashimoto for helping me bring this across the finish line yesterday. I will have a column on the University of Texas shooting in tomorrow’s issue of the Dallas Morning News. Guess what position I take? I wrote the thing in like 30 minutes. Thanks to Sharon Grigsby for the heads up. 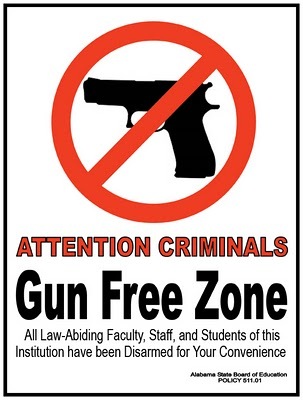 Yesterday’s incident with a gunman on the University of Texas campus proves unequivocally that rules declaring certain places “gun-free zones” do not work. All those restrictions do is disarm law-abiding people. 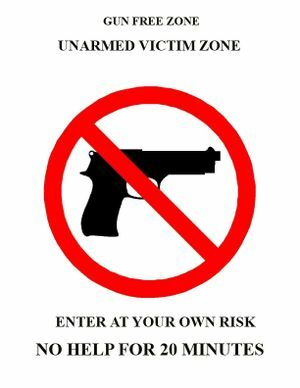 Gun-free zones are shooting galleries for homicidal maniacs who are assured that their victims won’t be shooting back. Exactly how is it that the Bill of Rights is prohibited on college campuses? John Woods, a UT graduate student who organized an anti-gun rally last year, disagreed. He said that having more guns on campus wouldn’t improve security. “If there were multiple students running around with guns, it would’ve made the police’s job a lot harder this morning,” Woods said Tuesday. He was a student at Virginia Tech University in 2007 when a gunman killed 32 people, including Woods’ girlfriend. So Woods has been on two campuses where guns are prohibited and yet a nut with a gun showed up armed for bear. And he’s not seeing a pattern. And he did it in less than two years. Obama has driven Americans to start demanding a reduction in taxes, spending, regulation and government intervention. Polls show that independents have moved right and are staying there,” she writes. “A recent one, conducted by Democratic pollster Doug Schoen in late August for the conservative Independent Women’s Voice, calls it a “fundamental realignment” as independents now lean to the right by 2 to 1. The survey asked independents what they would like candidates to do. The list of answers is clear: ‘Decrease the size and scope of government, cut spending and taxes, balance the budget, reduce the federal debt, reduce the power of special interests and unions, repeal and replace the health care legislation, and decrease partisanship.’ Most Tea Partyers would agree with just about everything on that list. So would most Republicans. And they’d all agree with independents who said that they’re not getting those things from Washington. Notice what’s not on that list: climate change, financial regulation, bank bailouts, auto bailouts, troop surges, lawsuits on immigration reform, and repealing ‘don’t ask, don’t tell.’ (The only reason health care reform made the list is because independents want it scaled back.) 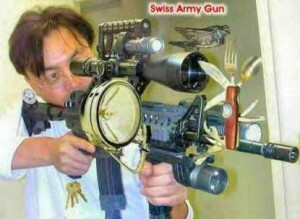 Notice too that these are precisely what we have been getting from Washington. Source with a hat/tip to Mike Hashimoto. People want neither the leftist agenda of Obama nor the big government compassionate conservatism of George W. Bush. For the most part, they want life, liberty and the pursuit of happiness. This is the Pledge to America I want to hear, and to see kept. However, in a climate where even Pres. 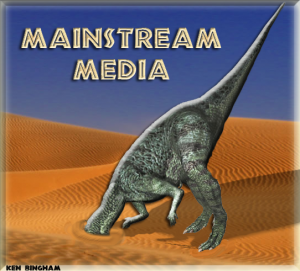 Obama’s budget director warned that our debt is “serious and ultimately unsustainable,” perhaps more should be expected of the establishment media. Indeed, our unsustainable financial situation led to the creation of a Tea Party movement — one of the biggest political developments in America over the past two years. It would seem to be the perfect news peg for ongoing media coverage of our government’s fiscal irresponsibility. Of course, it didn’t work out quite that way, did it? Instead, the establishment media ignored, then attacked the Tea Party movement — first as astroturf, then as racist, as Birthers, as hypocritical (for not having formed when the problem was less dire, and for gullibly expecting the government to make good on current entitlement promises or reform them before adding new ones), etc. The establishment media’s coverage of the Tea Party often seems devoted to discussing anything other than the issues at the heart of the movement. Thus, the establishment media reveals itself, not as the people’s watchdog against irresponsible government, but as the irresponsible government’s guard dog against the people. It is ground zero for manufacturing center-left consent. After all, how could the establishment have seriously discussed passing the trillion-dollar ObamaCare behemoth, when so much of the funding comes from “reductions” in Medicare and Medicaid spending that is unsustainable in the first instance? How could the media have gone along with the laughable CBO estimate that ObamaCare will reduce the deficit (based on assumptions the CBO admits are unrealistic), if they had to take our ginormous public debt seriously? How could they float an economy-crushing cap-and-tax scheme to combat global warming, or climate change, or climate disruption, or whatever it’s being called today, if everyone was forced to acknowledge how far government has already promised beyond its means? Emphasis added, and the full thing is here. Over the past 20 years, violent crime is down 43 percent (a 35 year low) and murder is down 49 percent (a 45 year low), according to the FBI stats. During this same period, government has been doing away with gun control laws and making it easier for people to carry guns. Less Gun Control: Over the last quarter-century, many federal, state and local gun control laws have been eliminated or made less restrictive. The federal “assault weapon” ban, upon which gun control supporters claimed public safety hinged, expired in 2004 and the murder rate has since dropped 10 percent. The federal handgun waiting period, for years the centerpiece of gun control supporters’ agenda, expired in 1998, in favor of the NRA-supported national Instant Check, and the murder rate has since dropped 21 percent. Accordingly, some states have eliminated obsolete waiting periods and purchase permit requirements. There are now 40 Right-to-Carry states, an all-time high, up from 10 in 1987. And all the while the number of privately owned guns in America has grown by 90 million. So, where’s the pained hand-wringing about how “It will be like the Wild West if people carry guns” and “There will be shootouts in parking lots” now? Any local members of the media who made such claims back when concealed carry was passed in Texas — ahem, you know who I’m looking at — care to ‘fess up? 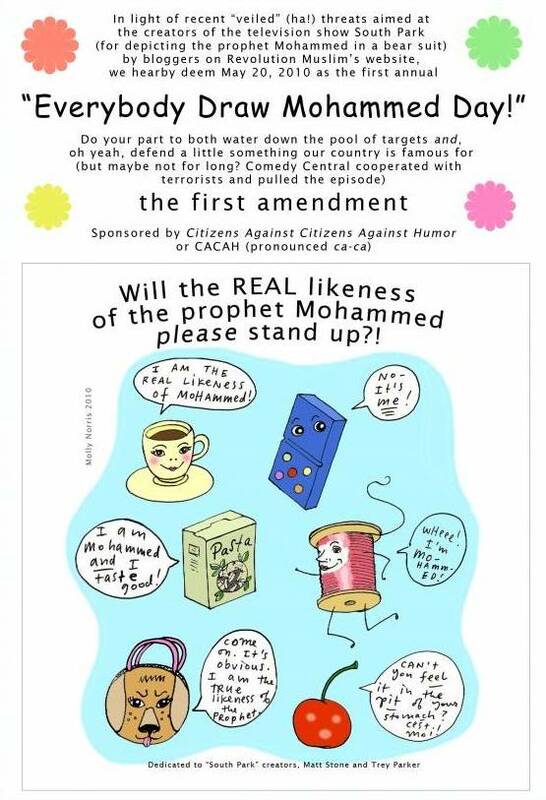 Last year an American cartoonist bravely tried to fight back against the threat to free speech posed by radical Islamists by creating Everybody Draw Mohammed Day. She did this in response to the worldwide death threats against Dutch cartoonists who had dared draw pictures of the Prophet, which is against Islamic law. Now she has, at the advice of the FBI, gone into hiding because of threats from radical Islamists hijacking a peaceful religion. 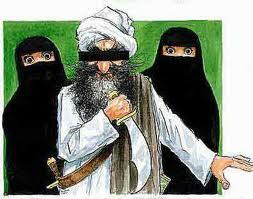 Those who support free speech and the free exchange of ideas cannot countenance this ongoing suppression. This is not about insulting Islam or supporting any religion at all. It is about standing up for free speech and not being cowed by radicals who believe their religious beliefs are chains on the rest of the world. Please join in the fight for free speech. They can’t silence us all if we stand together. This effort, by the way, welcomes free speech advocates of all faiths and creeds. Incidentally, here’s what prompted the fatwa against Molly. Good news is the long-term trend. Bad news is too many people get caught up in trendy waves when charismatic political messiahs (from left and right) arrive on the scene. Washington (CNN) – A new poll indicates that only one in four Americans say they trust the government to do what is right always or most of the time, one explanation for the anti-incumbent sentiment in the country today. According to CNN/Opinion Research Corporation national survey released Tuesday, 25 percent of the public indicates that they trust the government in Washington to do what’s is right most or all of the time, with 66 percent saying they trust the government to do what’s right only some of the time and eight percent saying they never trust the government. “That lack of trust in government is not a recent phenomenon – except for a brief spike fueled by patriotism immediately after 9/11, a majority have not trusted the government since the early 1970s,” says CNN Polling Director Keating Holland. But the recession appears to have made matters worse. “Ten years ago, roughly four in ten said they trusted the government always or most of the time; that number dropped to the mid-to-low 30′s in the middle part of the decade, but then dropped to the 20s in 2008, where it has stayed ever since. The all-time low in CNN polls was in the summer of 1994 – just before Newt Gingrich led the GOP to take control on Capitol Hill – when only 17 percent said they trusted the government most or all of the time,” adds Holland.